The Panis collection takes its inspiration from the iconic image of a large loaf of bread, a veritable local cult, becomes thus the inspiration for a line of upholstery with generous, soft shapes that can be declined in all possible configurations, from chair to sofa to bed. The design hints to the cuts traditionally applied on bread dough. The swift and essential lines, though never severe, that shape the entire collection also hint back at the stamps traditionally used by each Altamurana family to mark their own loaves. Please inquire fabric or finish variations and pricing. 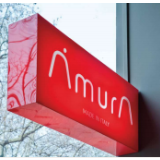 AMURA means “amore”, or “solar eclipse” like in Tahitian, or “wide smile” like in Japanese. But above all, Amura is the Mediterranean warmth of the territory of its origin: Altamura. Altamura is the fragile and authentic beauty of the South, which is known for traditional craftsmanship; quality is a given. Amuralab is constantly ongoing research of natural materials, and how to create a perfect symbiosis of form and function with design, paying obsessive attention to artisanal finishes in a technologically advanced context. These are the values in AMURA.